To celebrate all that is wonderful about summer, which for me is the fact that there's no snow (yay), the Hero Hostesses have gotten together for a fun week-long blog hop. You should be arriving from the blog of talented Hostess Virginia. If not, please start at the beginning of the hop here at the Hero Arts Blog where you'll find the master list. If you find a broken link on the hop please report it to blog@heroarts.com. On a hot summer day one of the things that I think of is a frosty glass of lemonade to help quench my thirst. So to honour that I've made a card with a jar of lemonade. I embossed the jar image onto vellum with silver ink and clear embossing powder and then coloured the back of the vellum with a yellow Copic marker. I added some silver sequins as my "ice cubes" and created a straw out of washi tape. And to finish off the drink I glittered my lemon slice for a little added sparkle. I'm sharing a recipe for Sparkling Lemonade, a drink I have on hand all summer for those who don't drink alcohol, like me. Combine sugar and water in a saucepan and cook over medium-high heat, stirring occasionally, until sugar is dissolved and mixture becomes clear, about 5 minutes. Cool to room temperature. Squeeze enough lemons to make 2 cups of lemon juice (approx. 10-12 lemons). Combine with the simple syrup and store in glass container in refrigerator. For lemonade place ice cubes in a highball glass, add ¾ cup (6oz) of lemon mixture and top off with ½ cup (4oz) of carbonated or sparkling water and serve with a lemon slice. This is a pretty tart beverage so the ratio of lemon mixture to sparkling water can be adjusted to suit individual tastes. Now onto Anita's blog. I can't wait to see her creation! What a very clever way to make lemonade in the jar for your card!! Such fun details. Makes me thirsty!! I'm having a great time on the hostess picnic!! Hugs. Love, love, LOOVE your idea for ice cubes, Nancy! Lemonade is my drink of choice when it's hot, too, nothing better! Thanks for that recipe - sounds like a keeper! Sue, wonderful summery card! I love your design and the creative way you created the ice cubes, straw and lemonade! The sparkling lemon slice looks fab too! I can't wait to try your sparkling lemonade recipe - it sounds delicious and very thirst quenching! What a refreshing idea! I must remember to try this on vellum too! So cute. I love how you used the sequins as ice cubes and added glitter to the lemon slice. So clever. So glad I could share in your summer cool off beverage of lemonade. This card is perfect for a hot summer to just say "HI" and give the person a treat of a card. I'm having a ton of fun on this picnic! Wonderful idea for a jar of lemonade... I love this card its perfect. I love how you did the jar of lemonade, very creative! Sue, I ADORE your sequin ice cubes - so very clever! Fabulous card for the hop! Wonderful lemonade recipe too! Your card is so cute. Especially the jar and ice cubes. What a neat idea. Love your mason jar technique! Thanks for a great summer recipe! Brilliant use of sequins :) Fabulous card, Sue! I love the sequin's as ice cubes, Sue! Lovely touch! I may have to try out your sparkling lemonade...sounds wonderful! What a great idea for the lemonade jar. love it! oh my gosh, those ice cube are da bomb! very clever! Wow! This is so clever and the sequins are perfect ice cubes. Love this! the lemonade looks great too! Thanks! Gosh, what brilliance. Sequins, vellum, just the color is fabulous. Wonderful. You are such an expert with vellum, Sue! This is no exception! Love the straw peeking out and yummy lemonade looks delicious! I know David will LOVE this recipe!!! 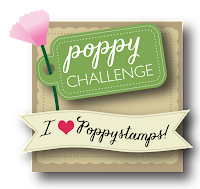 So glad to be in the blog hop with you! Oh I love how you made your jar of lemonade!! It really looks frosty and the sequins as ice cubes is genius! What a cute card, loving the lemonade jar what a cleaver idea! Thanks for the recipe too! Your card is so cute and clever. And sparkling lemonade is just in time for the summer heat we're having. What a lovely and "refreshing" card, love it! Nothing says summer more than lemonade! Love the card and inspiration! Very fun card - love the sequin ice cubes and the washi tape straw!! Your lemonade jar looks awesome! Very cute & fun card. Thanks for the recipe too; I love all things lemon. This is so pretty. Makes me long for something cold to drink now that we have such hot hot days in Sweden! Such a cute card. You are so creative to use he sequins and washi tape to complete it. LOVING the mason jar of lemonade-so fresh and homey! TFS! Love your jar of lemonade, Sue! So clever to use sequins as ice cubes and what a wonderful straw!! This is cute and I love the artsy color splashes and embellies on the side! Such a cute card :) Love it! Your jar of lemonade looks quite refreshing. Thanks for the recipe - sounds quite tasty. Love, love, loving your lemonade jar! The vellum, the sequins, the sparkly lemon, perfect! Nothing says summer like lemonade and yours looks amazing! :) Just love this card! Lemonade is my definition of summer!! Love all the cool ways you made it interesting. What a great card, I love the ice sequins! Wow! Your card is amazing! And thank you for sharing a recipe of lemonade! This card is quintessential summer and picnic! Love all the details. Thanks for sharing your lemonade recipe. The "lemonade" on your card looks so realistic and yummy looking! What a great card! not sure what is best - your recipe or the fun card! thanks for the details. Wow, it looks like a real jar! Your lemonade card is fabulous Sue and I love the ice cube effect!! The ice cubes and straw are genius. Thanks for sharing. Your card is refreshing! Love the sequins, great idea. Fun card! Thanks for these tips & ideas and for the recipe! This card is perfect--very creative and inspiring. Love your work. The lemonade sounds good. Wow! Love the lemonade jar. So very clever too to make a straw out of washi tape. This is a real fun card for the summer. Never seen sequins used so cleverly on card ! Loved the chilled lemonade n straw too ! Oh my--this looks good enough to drink! You used embellishments and Stamp Your Story so cleverly! Thanks for the inspiration! Wowzer! What a card! I'm going to do my best to duplicate this & send it to my son as he loves lemonade. Thank you so much for the inspiration & great ideas! Outstanding card! I will also try your lemonade recipe. Sounds so refreshing! Sue, how clever to use washi tape for your straw and sequins for your ice cubes. Your lemonade recipe sounds very tasty and refreshing ~ TFS! Stunning card Sue, love the 'ice cubes' in your pretty jar!! Cute card! Love the jar of lemonade and the straw! Very fun! Love your lemonade jar! So creative! The lemonade recipe is so refreshing too. Thanks Sue! Such a cute summery card!! I love how you used sequins for the ice!! Very cute!! Now you have made me thirsty for some yummy lemonade!! Lol. Thx for sharing!! This. is. adorable! Love the sequin ice cubes. I want a jar of that right now! Your card looks soooo refreshing--right down to the ice cubes! The perfect card to go with your yummy lemonade! So cute!!! I LOVE the jar!! Esp the 'ice cubes'!! What a great idea to use sequins for ice cubes. Love the colored vellum. Thanks. Sensational card!!!! Love the jar, the sequins (except I thought they were lemon slices!...lol...instead of ice cubes), the brush-strokes which perfectly match your enamel dots, and everything else, too! Like the sequin ice cubes. 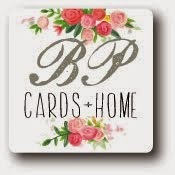 Love the pops of color on the left hand side of your card! Nothing says summer in a glass like lemonade Sue! I love how you put your own stamp on the beverage as a card and in the fridge! Well done on both counts--those sequin ice cubes are perfectly simple just like your lemonade syrup! Well done friend! I just LOVE all the clever techniques you used on this card, Sue...so fun!!! Oh, I'm so sorry...thank you so much for the recipe! Perfect for a day like this...we're dying from the high humidity! Love your lemonade jar, especially the ice cubes in it!! There are so many wonderful techniques on this, I do not know where to start. A straw from washi tape is genius! Love the card. 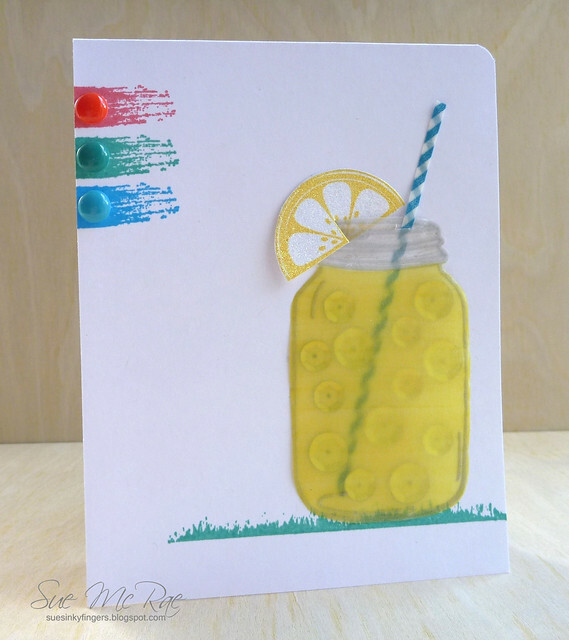 What a clever way to create the glass of lemonade using the embossing powder and velum! The sequins are the perfect touch! Perfect LEMONADE card! So clever! Love your recipe. Loving this lemonade...and the sequin ice cubes are so clever! Your sparkling lemonade sounds so refreshing...I will have to try it! 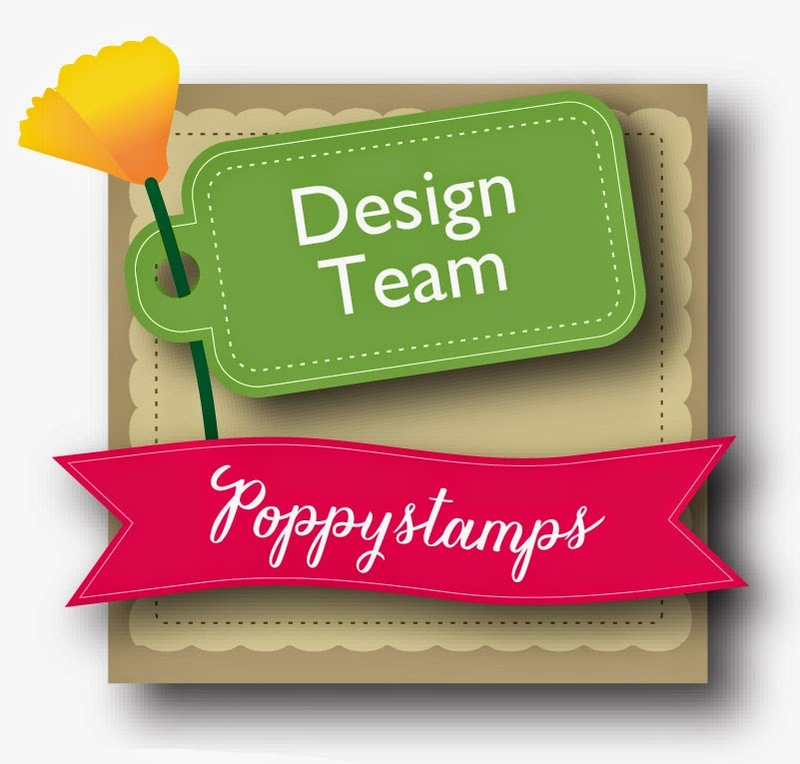 So much delightful creativity!And the design is simple, yet so very interesting and full of tiny wonderful touches. Drink sounds very fine, too! Good idea for the ice cubes. Yummy lemonade--I like the sequins as ice cubes. Thanks for the recipe. What a clever card! Love it! nice creativity with using the vellum, sequins, and washi tape to make a jar of lemonade - it's fun to get inspiration on new ways to use supplies I already have! Now THAT is a cool jar of cool, refreshing lemonade! Love the colored vellum and the sequin ice cubes! Wow! Your jar card had me stopped and staring! Thanks for the explanation of how you did it (aha! coloured with copics!) it is very cool. It is very clever how you made all the elements. Love this fun summer card!!! the sequins as lemons in the jar is pure genius! Fantastic card. I love the technique you have used on the jar of lemonade and the washi straw is very clever. I love proper lemonade, not that horrible oversweet soft drink you buy in the supermarket. A canning jar full of lemonade- what a great card! Sue, Cute, Cute, Cute! I love the straw and "ice cubes". Thanks for the lemonade recipe! I'll have to try it soon! Thanks for sharing! So cute and so clever. Just such a summery cheery card! The lemonade sounds good. Love what you've done with the mason jar! the sequin ice cubs are amazing. Love the lemonade recipe! This is just darling, Sue! I haven't used my mason jar stamp, but you've inspired me! Looks great , love the texture! Such a cute card, thanks for sharing it! Omgosh, I adore everything about this card! The card looks so sweet, Sue! What a stunning card, so delish! I'm certainly going to try the recipe too, but we are in the middle of winter so I think I will wait for summer! what a beautiful card, I really love the jar full of lemonade. The sequins make such great ice. Your newest follower.. I love that lemonade jar and the brush strokes. Thanks for the inspiration! I just love the idea of silver sequins for ice cubes for your lemonade...it is adorable. Fantastic idea! And I love lemonade too. Your card is nothing short of inspired! How fabulous it is - those sequins look so realistic behind that vellum. Beautiful colours and a wonderful result. Love that lemonade jar - fabulous idea! You're making me thirsty with your clever lemonade card. The sequin ice cubes are so cute! I wouldn't have thought of that, but it looks good. Superbly done Sue! I am now very thirsty! Super cute card! Love the lemonade and the recipe sounds great! Love your lemonade card :) so cute! Love the lemons today, Sue - your card and recipe both are wonderful!! I just love the sequins for ice cubes - great idea - and I love the colorful short brush strokes with the enamel dots! So fun hopping with you this week!! Love the washi tape straw, I would have never thought to use tape. Love me some lemonade too! This card is so refreshing. Love the straw made of washi tape and the Brushstrokes stamp set you used. love the sequin ice cubes!! mouth watering recipe for lemonade!! Wow, what you did with that jar--so clever. The idea of sparkling lemonade sounds so refreshing, I have to try it. Omg, your card is absolutely darling! Thanks so much for sharing it with us. Thanks also for the great Lemonade recipe. You gals have all gone above and beyond, I'm completely inspired. Cute lemon aid jar and lemon!! Makes me want to go have a glass!! Super idea of the lemonade jar. Love this card! This is adorable! I love the sequins IN the jar! What a clever idea for the lemonade jar and sequins for the ice cubes! Oooohhh yummy card and delicious recipe! Love that you have coordinating card and recipe! Beautiful summery card! Love the lemonade in the jar! Too cute! Just looking at your card I could taste the lemonade. Fabulous! What a great card....love the lemonade in the mason jar. Too cute! This is really a cute card and love how you added the lemonade in the jar. Thanks for the lemonade recipe. Thanks for sharing. Your lemmonade jar on your card looks as if you could pick right off your card and drink out of it. Love the sequins in the lemonade jar. Cute. This card is so cool. Love the sequins in the lemonade. Thanks for sharing.